The Samsung Galaxy Tab 8.9 is the latest member of the brand's tablet family, but is it truly capable of taking on the Apple iPad 2? What's the perfect sized tablet? If we are going by sales, it's the one that measures in at 9.7-inch Apple iPad 2. That hasn't stopped Samsung covering all the bases with its Samsung Galaxy Tab 8.9 tablet - the latest to join the growing legion of Galaxy Tab devices. If you loved the look of the Galaxy Tab 10.1, then you'll be happy to hear that the 8.9 is near enough identical in terms of design. Samsung has once again taken the minimalist approach, opting for just on/off and volume buttons as the only physical controls on the device which means, somewhat disappointingly, that there's no sign of USB or SD card ports. At 453g, it's over 100g lighter than the iPad 2 (613g) and the Samsung Galaxy Tab 10.1 (565g) and measures in at just 8.6mm thickness which as a result makes it extremely comfortable to hold in one hand. There's no Android 4.0 Ice Cream Sandwich on board so you'll have to make do with Android 3.2 Honeycomb with Samsung's Touchwiz 4.0 UI overlay. That brings a handful of features including a series of mini apps that can be accessed by swiping up from the bottom of the screen. We tested OnLive and Netflix Android apps over Wi-Fi and found the experience a lag- and buffer-free experience. We've already mentioned how much we love the screen for watching movies (1080p HD quality), but unfortunately we can't be so glowing in terms of the audio performance from the speakers located at the bottom of device which were loud but generally tinny with music and video playback. 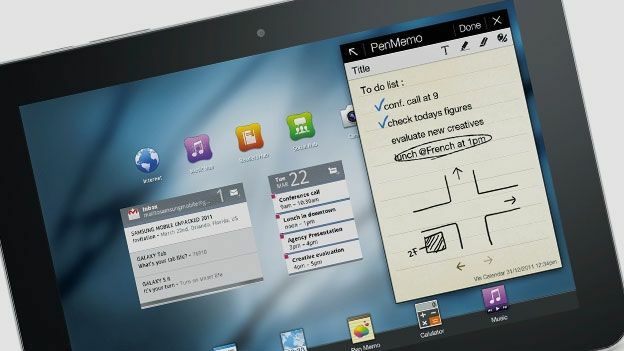 So where does the Samsung 8.9 rank in the current hierarchy of tablets? Well, we'd say quite highly. It shares so many of the characteristics that made the Galaxy Tab 10.1 such an impressive device, but manages to condense it all into a smaller, more bag-friendly design. The screen is brilliant and ideal for reading and watching movies, while the Touchwiz overlay helps to separate it from many of the other Android 3.0 tablets currently on the market. We would have liked to have seen some USB or SD card support like the Asus Eee Pad Transformer Prime but Samsung appears to be putting faith in its All Share platform and DLNA instead. Ultimately though, this is another fantastic Samsung tablet that surpasses its 10.1-inch compatriot (albeit with a bigger price tag) and is a great alternative to the Apple iPad 2.